It certainly is a wonder how Wayne Wonder (b. Vonwayne Charles) gets through his day. After more than twelve years as a professional singer, Wonder has risen to the top with one of the sweetest voices in Reggae. He has also co-written some of the biggest dancehall tunes to come out of Jamaica, in addition to starting his own project called Alias (with an offshoot called The Entourage) alongside producer Dave Kelly. His new record label, Singso Records, has the industry buzzing. 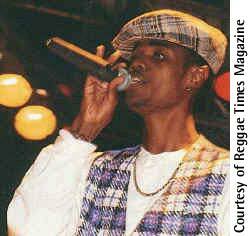 He has also been instrumental in developing the careers of Baby Cham and Buju Banton. To top it off, Wonder’s new CD titled “Da Vibe,” is making waves throughout the community. With all of this activity, it is amazing that he has time to tour with Buju Banton this fall and makes time to charm and praise his fans, conduct interviews and give the impression of having a laid-back and relaxed lifestyle. Born in Eastern Jamaica, Wonder moved to Kingston at a young age. He loved to sing at home for his parents and eventually became a part of the youth church choir. In 1985, Wonder was introduced to dubmaster King Tubby, who helped him make an original track called “Long and Lasting Love.” Soon after, Tubby passed away which devastated Wonder who had looked to him for inspiration. After recording a few more original tunes, Wonder met up with his elementary school buddy, Dave Kelly, who was an engineer at Penthouse Records. In 1991, Wonder introduced his friend Buju Banton to dancehall. Wonder co-wrote Buju’s world-famous hit “Murderer” as well as “Deportee” and “Boom Bye Bye.” The two of them shared the mic on many tunes, including “Bonafide Love (Movie Star),” which perfected the singer/DJ sound. But Buju signed to the U.S.-based Mercury label, while Wonder was left to fend for himself. It was at this time that Wonder started the Alias recording project, where popular dancehall artists created alias names to disguise their true identities so they could reap the benefits of flexibility and anonymity with their music. Wonder has also started up his own label called Singso Records which showcases Mr. Easy’s track, “On the Run,” and Wonder’s own “Snitches and Spies,” on which he played all of the instruments, sang all the vocals and did the arranging. Singso’s first riddim, “Ambush,” is making its mark in the dancehall. I first heard Wayne Wonder’s music on a Renaissance Sound System cassette that had sampled his tunes “Keep Forgetting” and “Let Your Conscious Set You Free,” which made a lasting impression on me. When I heard he was going to perform alongside Buju Banton at the Monterey Reggae Festival (Labor Day weekend 2000) to promote his new album, I was eager to see him live. As we were talking, his charm and charisma reaffirmed that he is proud of the work he does, and that Wayne Wonder’s time is now. And of course he wouldn’t let me forget his mantra: it’s all about the music. Laura Gardner: When did you first know you could sing? Wayne Wonder: [laughs] Well, my first experience was at about three years old. I used to sing for my mom and entertain the whole family. WW: Yeah, yeah, you know? And from there I sang in the kiddie’s choir in church. LG: So when did you first go into the studio? WW: My first time in the studio was in ’85 but I didn’t actually record in ’85. I started recording the right way in the late part of ’87-’88. LG: Did you grow up in the country or in the city in Jamaica? What do you think the differences are? WW: I actually grew up in the city. I was born in Portland (in the country), but I was brought to the city ever since I knew myself at a tender age [laughs]. In any city it’s more fast-going, more ethnic, more clustered, while in the country there’s more relaxation and you can get a good meditation. I think in the country you grow up even better too, but what am I to do? I’m just moving with my parents [laughs]. Laura Gardner: How did your nickname come about? Wayne Wonder: Well, Wonder [pause]. I am a conservative type of person, so sometimes when I’m chilling with myself, people always come ask me, “What’s wrong with you? What are you wondering about?” People call me Wayne Wonder and it also goes back to football [soccer] because I could do mad skills with the ball and people would marvel and wonder how I could do it. LG: Really? Do you think you could have become a football player instead of a singer? LG: Nice! How did you link up with [producers Dave and Tony] the Kellys? WW: Actually my first encounter with a Kelly was not on a musical scale. It was from primary school. Dave and I went to primary school together and we were like boy scouts. That’s where we made the link, but musically, we didn’t link up until ’87. We were all excited to work together. LG: Dave’s very talented as well. Where do you get your ideas for song lyrics? WW: Well, it varies, you know? On an original level, my songs come from my experience and my friends’ experience. It’s always a live experience-anything that happens around you. It’s so easy to just put it to a song. It’s so easy [laughs]! LG: Do you see your lyrics as giving the fans what they want to hear or do you believe in what you’re singing about? WW: Anything I sing is supposed to be genuine. It’s not supposed to be make-believe or I’m making something for the crowd to jump or to hold up their hands. What I say is from my heart. You must be sincere. So when I sing a song, people are supposed to feel it. LG: There are a lot of dancehall songs nowadays bashing the battyman [gay people]. Capleton, Bounty Killer and Buju Banton have gotten flack for it. Do you think this is a trend in the music or do you think it’s a foundation of the music? WW: No, I wouldn’t say foundation. We all know what the Bible says. But then again, Buju Banton did “Boom Bye Bye,” and that was then. I don’t think anybody can ever come with more homophobic lyrics to hit the market than that. WW: [laughs] Ha! Well, “Keep Forgetting” is directed towards haters. I use fassy to mean lesion of the skin, or sore. I use it to mean something or someone that I don’t want to be around: people that are corrupt, you know? I don’t want to be around fassys: people that hate you if you’re trying to move up, people who bring you down when you’re moving up or people who criticize your creative work when you put it out. That’s what I’m talking about when I say fassy. LG: So you don’t equate it with the battyman? LG: I know you have a reputation with the ladies. How do you react to your image as a heartthrob? WW: Having been around it over the years, I have more control now. I’m learning how to deal with people better. I’m learning not to let the ego get the best of you! People like people, you know? Wayne Wonder is a down-to-earth type of person, so people can always approach me. They are not scared to say, “Yo Wayne! How are you doing?” …That’s me, man–I’m a lover not a fighter. LG: Luciano has a song on his latest album called “Ulterior Motives” about people getting close for reasons other than for who you are. Do you come across that frequently? WW: Yes, definitely. You’re always going to find that. My grandmother always told me you must keep to your old roads and stick to your original friends and just go through smooth, be careful and stay positive. LG: You were one of the first people to sing in patois. Why did you decide to do that? WW: No, let me tell you how it came about. It’s so easy for me to write collaboration lyrics for a DJ and a singing sound. When I first did “Sweet and Sour” there were no Jamaican singers swinging it that way. Then when I came with it, I started to hear everybody. But I know it is a form of creativeness. Just how I used to listen to songs and cover them, I know musicians have to motivate other musicians, so I don’t find that threatening or offensive. But there is an energy when a singer and a DJ come together, like when Buju Banton and Wayne Wonder hooked up I sang this smooth melody and the DJ came in with his rough vibe. What I did now was I didn’t really come and sing it like a DJ, but I put more melody to it… It sounds like I’m DJ-ing but it’s milder. It’s really an experiment proven to be successful. Laura Gardner: Who were some of your musical inspirations? Wayne Wonder: Well my musical inspiration varies. Originally I was brought up in the church, so gospel was a must for me. Then I used to live in Rae Town where oldies music played every Sunday and Wednesday night and even when I closed my door I still heard it. So I was always around music. But one-on-one, blow-for-blow, pound-for-pound, I used to listen to a lot of Mahalia Jackson. I listened to Linval Thompson-reggae. I listened to Beres [Hammond] coming up, Bob Marley, the Wailers, Cocoa Tea. My inspiration varies because everybody plays a big part. If you interview an artist and they say nobody inspired them, it’s all lies! [laughs]. LG: You and Buju Banton used to be incredibly tight and then he was signed to Mercury Records. You guys are on tour together now so you must have repaired that damage. WW: The business is sticky. It’s a funny business. Mercury signed Buju Banton. Mercury didn’t sign Buju Banton AND Wayne Wonder. So you know that Wayne Wonder was still out there, so I have to go get mine, seen? [laughs]. Where the brotherly love and friendship is, there wasn’t as big a change in that. The clouds were surrounding the music and the company. If the company didn’t say, “Do a song with Buju,” nothing had been done. When me and Dave Kelly and Buju Banton used to hook up in the studio, it was just non-stop creativity and music, then when the company stepped in, I thought they were dictating too much. They had to dictate whether Wayne Wonder was going to do one or two songs on this next Buju album, so it broke the whole momentum and the whole creative flow, you know? But I guess that’s just the business. LG: But it’s back on track. WW: Yeah! Well, you know Wayne Wonder and Buju Banton have a chemistry no matter what, even if you don’t hear we from five years. And everything happens for a purpose because if Wayne Wonder didn’t go out there and bring Baby Cham to school, there wouldn’t be a Baby Cham or there wouldn’t be an Alley Cat. So you have to look and think on a really optimistic level. I’m a very optimistic person so I don’t really look at the situation and say, “Why? Why did Buju done break up?” I don’t look at it like that because even Buju said the other day, “Bwai, things haffi happen because if it wasn’t for the way things have gone (you went your way and me go my way), Baby Cham wouldn’t borne.” Things do happen but it’s just music. LG: What has been the best part of the tour so far? WW: The chemistry on the tour is there. It’s so easy to fit in, so I enjoy every moment of the tour. WW: It’s a mind thing. When I look at the tour schedule, I worry about it! [laughs]. Sometimes I don’t even know what the day is, like I’ll know today’s Sunday, but I won’t know the date. But when the tour boils down, you start counting: I’ve got a week, I’ve got 2 weeks, no! But when you forget, you just have to go. LG: How would you characterize your sound to someone who has never heard you? WW: Wayne Wonder has a unique sound. If you listen to everyone that sings vocals in the Reggae business right now, you can tell who’s singing. You know Beres’ voice, you know Wayne Wonder’s voice, you know Cocoa Tea’s voice, you know Sanchez’ voice, you know Michael Rose’s voice. When I came into this business, I always had creativeness on my mind. When I first went into the studio, I had come up with hundreds of original songs, but at that time, there was a different trend. Everyone was covering, covering, covering. It was the only way to break into the business at that time. When you had an original song, the engineers didn’t spend time to listen to it. They wouldn’t give you the chance and they’d come in after the first verse, “Why don’t you sing something that everybody knows?” It was the system at the time and I did what I had to do. There’s a time for everything and when I developed and came back, I said, “Now I’m going to give you something original.” And I’ve been doing original ever since. The first song that came out that had a big impact in the dance hall was a song called “It’s Over Now” on the “Cover Me” riddim, so I knew my original tunes could work but at that time everyone was covering Sanchez and Singing Melody, you know? LG: Original songs are better. WW: Original stuff lasts. I feel proud! I go on certain shows and I can really jam and I feel more confident and it comes out better. I don’t have to be shy if R. Kelly or anyone else is in the crowd. But I do my own stuff, man! LG: And no one is saying, “He didn’t match up to Bob Marley,” or whomever. WW: Yeah. Just straight up coming to you with the Alias sound. Laura Gardner: So tell me a little bit about the Alias project. Wayne Wonder: As you know, Alias is really a recording project. When we come together and decide to record, we just support each other. I say the motto for Alias is that it’s not about the recognition, it’s not about the hype, the ego nor individuals, it’s about the music and the work that needs to be done. So we just stick to that. It’s like Baby Cham coming up as a young artist and we can show him what to do and what not to do, and let him develop as an artist. That is part of my job… It’s like I have that naturally. I just love that vibe. Even if I don’t have a project and another person has a project happening, then it gives me more strength, cause I know I still play a part. A lot of people let the ego get to them, so them say, “Oh, nothing’s going on for me now.” I don’t look at life that way. LG: So who’s a part of Alias? WW: Me and Dave Kelly are the original founders of Alias because when I left Penthouse [Records], I decided I didn’t want to go straight to Madhouse [Records]. We wanted to form something and we came up with the X-Large Alias vibe. A lot of people still don’t know what it is all about because it’s a type of underground thing. Everybody has an Alias name–like Dave Kelly’s alias is The Stranger, Baby Cham’s alias is Herman, Frisco Kid’s alias is Bops, Frankie Sly’s alias is Joke Dem. So it was like a fun thing for us. WW: Mine is Surprise. Like on “Keep Forgetting” I’m DJ-ing on it, you know. A lot of people think I’m bringing in a new DJ called Surprise, but it’s me, myself and I [laughs]. A lot of people e-mail me and say they want a song with me and Surprise and they ask how much am I charging and how much is Surprise charging! So I know what I am doing can work. When I do it, a lot of people marvel because they don’t know how I do it! It sounds like it’s two people up there. When I come out [singing], “Blaaa-zing” then [DJ-ing], “a di only way fi stay alive,” people marvel about it! They say, “Yo! The kid’s crazy!” But it’s not crazy, it’s just creativity. The creative juice just flows, you know. LG: What do you foresee for dancehall music? WW: If it’s up to me, dancehall must reach a whole other level. I’m a musical type of person. We start a lot of trends in the business. Dave Kelly and Wayne Wonder done come up with certain things from back in the days with Buju. Everybody follows what we do, even if they put it a different way, just like “Sweet and Sour” style. Everybody took it up: Vegas–Vegas never used to sing like that, Richie Stevens did it, Devonte. Devonte is my soldier. I trained Devonte. A lot of people don’t know that. I even spoke to him today because I produced a song that is supposed to be released on a VP [Records] album. LG: There were rumors that you and Devonte had problems. Frankie Sly was sleeping in the car when I was writing this song and Baby Cham started to kick him, and I said, “Yo! He a sleep on the vibe. I say get up!” And I just came up with the line, “New tune weh mi use and wake dem.” I was talking about Sly! [laughs]. So me say, “New tune weh mi use and wake dem/ Biggias phrases weh mi tek and trace dem,” which means I’m gonna write some lines where I let people think what they want to think. “Biggias” means more than one. I just kill them! Playing minds with them; it’s all in their minds. It’s just the vibe! But me and Devonte have no beef. I even spoke to Devonte today. Laura Gardner: Is there anything else you’d like to say? Wayne Wonder: I’d like the world to know that Wayne Wonder is launching his own label also: The Singso Records and I’m working with a couple of new DJs because DJs always give me a vibe. That is my sickness! [laughs] That is my addiction! I just love the DJ vibe from ever since. LG: So who are you working with? LG: Wayne Wonder is huge in Jamaica. Do you foresee coming over stateside for good? WW: Basically I am landed, so anything can happen! I’m a legal alien so you never can tell. As I say, I am not going to limit myself so the sky’s the limit. You might see me hook up with some rock group or some hip-hop group because I look at music as music-no limit to it. LG: Is there anyone you’d really like to work with who you haven’t had the chance to yet? WW: Yeah. That’s me. That’s my work. When I’m not working I’m supposed to be relaxing. It’s a mind thing. My mind does too much. So when I’m off the stage I’m laid back. Luckily I didn’t have any gin and juice, but I’m just laid back, you know? When I’m on stage, it’s entertainment so I’m gonna come to entertain. When you listen to Wayne Wonder songs, you’re not supposed to hear the songs as they are on the record. You’re going to see the performance plus the surprise. You’re going to get a full entertainment package! For real. LG: It has been a pleasure having you here. WW: Let the love flow and let the music grow and peace and one love. And remember to pick up “Da Vibe,” the new album. It’s all about the music. As I say, it’s not about recognition, not about hype, not about egos nor individuals, it’s about the music and the work that needs to be done. So as our creative juices flow, we stick to our philosophy of using the studio to sing and to have nothing but fun, so we do it.